"Exemplifying the highest standards of scholarly work in the field of human ecology." Daniel Stokols is widely known for his contributions to the fields of social ecology, environmental and ecological psychology, public health, and transdisciplinary team science. He is Chancellor’s Professor Emeritus at the University of California, Irvine and served as founding dean of UCI’s School of Social Ecology. Stokols also has served as consultant to the National Academies of Sciences, Engineering, and Medicine, the National Institutes of Health, the W.M. Keck and Robert Wood Johnson Foundations, and several community organizations. He is co-author of Behavior, Health, and Environmental Stress (1986), the National Academy of Sciences report on Enhancing the Effectiveness of Team Science (2015), editor of Perspectives on Environment and Behavior (1977), and co-editor of the Handbook of Environmental Psychology (1987), Environmental Simulation (1993) and Promoting Human Wellness (2002). "This book about Social Ecology was overdue. It opens a viable way to a mutual understanding within a still heterogenous field of research, scattered across the globe and coined for instance as Human or Social Ecology, Research on Sustainability and Global Change. By working out well-founded core principles, Dan Stokols identifies common assumptions and distinctive features between seemingly incompatible approaches. The elaborated relationship between Digital Age and the idea of the Anthropocene provide an integrative agenda for research and political action in the 21th Century." --Egon Becker, ISOE - Institute for Social Ecological Research, Frankfurt a. M.
"In his new book, Daniel Stokols successfully makes the much-needed attempt to lead social ecology into the digital age. He convincingly demonstrates how sound science and action-oriented, transformative research can and must go hand in hand in order to meet the great challenges of our times. A leading scholar in the field, Stokols masterfully intertwines well-informed analysis with insightful storytelling. ‘Social Ecology in the Digital Age’ is a must-read for anyone concerned with the field and an inspiration for committed young scientists. " --Thomas Jahn, ISOE - Institute for Social Ecological Research, Frankfurt a. M.
"We found this book highly readable and thought provoking. It would be an excellent text for an advanced undergraduate course or an early graduate-level seminar in a diverse array of disciplines, such as public health, geography, or sociology, especially if supplemented with further material on how to conduct social ecology research. Overall, this text provides a historical accounting of the evolution of social ecology and its transdisciplinary approach and cements Dr. Stokols’s role as a key leader in articulating a unifying vision for social ecology in the digital age." “…Stokols’ book provides a compendium of research (including his own) supporting his understanding of social ecology in the digital age…the book offers a well-substantiated account of prospects for strengthening our approach to social ecology.” – Calvin Tribby, Lilian Perez, and David Berrigan. 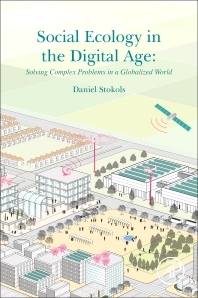 SOCIAL ECOLOGY IN THE DIGITAL AGE by Daniel Stokols is the book we have been waiting for. This thoughtful and thought-provoking book is written in accessible prose to be read by students, academics, and ordinary people concerned about the future of our planet earth and the dangerous trajectory many ignore or deny. Humankind needs to honestly identify, analyze, and tackle complex environmental problems in this digital age. The field of Social Ecology, with its transdisciplinary approach, offers hope for the future. A must-read for politicians, planners, government policy makers, and all concerned citizens. Stokols' magnum opus highlights the significant value of multi-scale, trans-disciplinary research in addressing the complex and wicked problems of modern life. Not solely an excellent synthesis, this book also extends social ecological thinking to the proliferating digital and virtual world we find ourselves in today. Highly recommended.